Hey everyone, I must apologize right now for saying that Chulip was the weirdest game I have ever played. Now, I won’t hang or electrocute myself for my screw-up, but I will tell you guys about a very unknown video game made by Capcom. I will warn you though that there are not enough therapists in the world to solve what mental problem this game has. So then, I guess you’re wondering what game I am talking about? 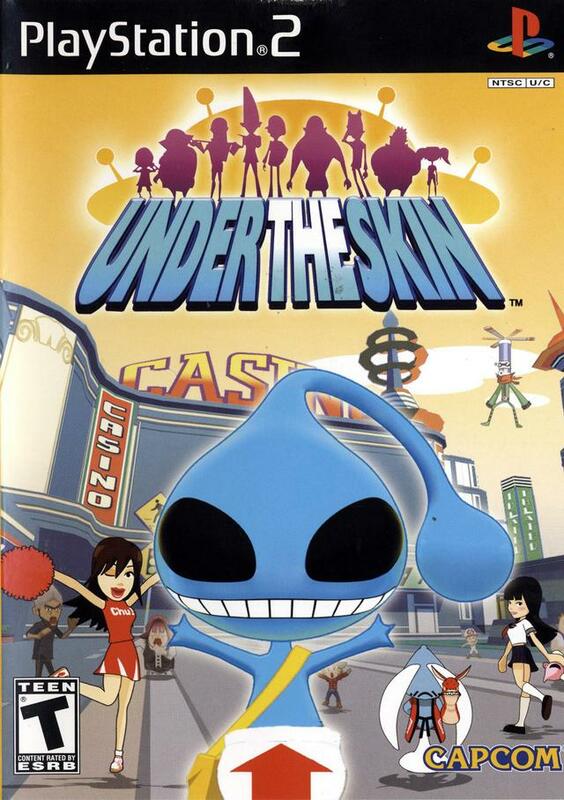 It’s a chaotic mental case of a game simply known as Under the Skin for the PS2. This little gem of a game is basically yet another over-the-top weird Japanese game that somehow got past the psyche screen. There are not enough medical pills to cure what kind of madness this game brings onto our mental stability. Let’s dive into this mental case of a game, and see what makes it tick. The story of Under the Skin is about a blue alien named Cosmi, who is traveling to earth in a ritual that he must do to become a great warrior. He accidentally crashes into a satellite and lands on earth. His goal on the planet is to cause as much chaos and mischief as possible. It’s a cute little story, but it seemed like not a lot of work went into it, but I’ll talk about it later. The gameplay in Under the Skin is hard to explain. It says on Wikipedia that it’s an action adventure game, but it’s more along the lines of stealth, action, and mini-games mixed together. There are about 8 levels, and some of them share the same goal, like collect 500 on your own or with another alien, get more coins than the other alien, team up to take down Nemesis from the Resident Evil game, and others. The main goal is to pretty much collect coins. The way you do this is to take a human disguise and use multiple array of weapons to get coins from the humans, like rocket launchers, elephants, pins, bowling balls, T-rex, laser guns, shotguns, hula hoops, and you get the idea. There are a lot of weapons you can use, and you somewhat have to be tactical on how you tackle each level. There is also a multiplayer mode and a co-op mode where you can do a lot of what you did in the single player. You can also choose different aliens after you beat them in the single player mode. You have to be careful though; if you’re hit once, your human disguise loses its clothes, leaving the human in its undies, and if you’re hit again, you turn back into an alien and lose some coins. You then must scan another human and make it your disguise. Some levels also have threats, like fast cars, gunman, thieves, and alien-tracking robots. The graphics in the game are very bright and colorful and everyone has a cartoonish look. The areas are small so you won’t get lost. However, even if the areas are small, large hazards like the cars, elephants, grim reapers, and etc make it easier for you to get hit by them. The music is, while not memorable, really wacky and crazy. It definitely has a rather unique art style, which kind of reminds me of Costume Quest, and Wind Waker since it has that unique cel-shaded look. The aliens also have unique designs that are different throughout each level. The humor, while out of my age limit, is rather cute and it is funny to see people fly around when you hit them with a boxing glove and when they all panic. There are however, a lot of glaring problems with this game that wouldn’t pass if it were released today. The game is really and I mean REALLY short! You thought Kane and Lynch 2 and Vanquish were short, it took me two and a half hours to beat Under the Skin’s single player mode. That would not fly today. It just annoys me at how short this game was. This game also came from Capcom, so I feel a little betrayed they would do this. Two-and-a-half hours are more like a 4-dollar DLC game. I also don’t like how repetitious the single player mode is and how simple and weak the story is. It’s like no thought, besides the opening and ending, were put into the story. I just hate how games of today think they can make a 3 to 6 hour campaign and just focus on multiplayer. Stop doing this, game developers! JUST STOP DOING IT! I mean seriously, I might have grown up with the N64 and into the modern days of gaming, but there are still things in the modern day game industry that piss me off! Make a worthwhile story mode and focus on multiplayer only if you have made a good story and worthwhile single player, which this game fails on both accounts of story and multiplayer. There just isn’t enough substance to make this a full price tag buy. There is just nothing memorable about this game! This seems like a game you would give a video game school as an assignment to see how you could make it better or something. This game is a mess, and there is nothing memorable or noteworthy about it. The levels and missions are repetitious, the story is half-baked, it’s way too short, and it just gets everything wrong besides a decent graphical presentation and just a really weird premise with cameos from the Resident Evil franchise. If you like this kind of weird crazy Japanese style game, then I could easily say yes, but for everyone else, just don’t go buy it. I mean if you were to buy it, just don’t pay 10 bucks for it. Now, it definitely isn’t black list worthy, but it almost falls in that area. The only reason I would recommend checking out this game is if you have some time to kill before the next big release or you just want to play a really bizarre game.